You might think these beautiful birds would resist a shower - unwilling to even fluff one of their colorful feathers out of place. But, that's not the case with these macaws who dance, sing, and flap their wings under the warm water. In this viral video, that's been viewed over 2 million times on YouTube, one stunning bird is already perched in the shower while the other makes a break for it himself. Mom has obviously left one out of the shower so the other could have their time - but he's got other plans. 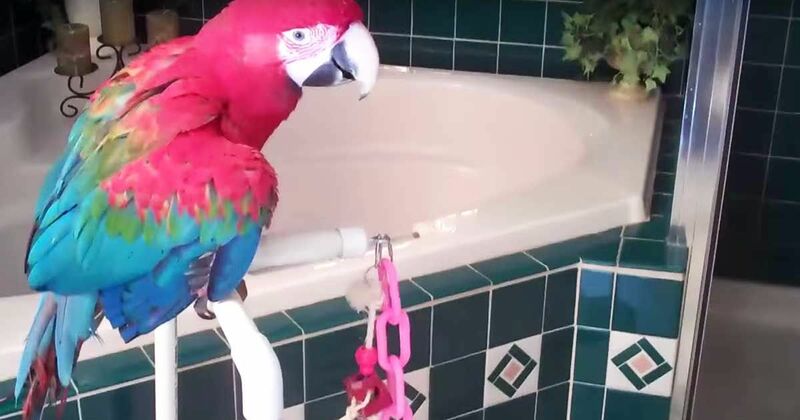 Tonka, the blue, green and red macaw, jumps down off of his perch and hops into the shower with his friend! He spreads his wings, makes some noise, and waddles around as the shower wets his feathers. His blue and yellow friend, Tiko, is perched closer to the showerhead, though. Up there, he bobs and weaves under the steady stream of warm water, and makes sure to clean under his big wings. Mom asks her feathery children multiple times if they're ready to leave, only to be given protests with squeaks, squawks and lots of dancing in the (shower) rain. The video is just too cute to miss - so check it out right here below! Wouldn't it be easier if all pets were as enthusiastic about taking a bath? Be sure to share this adorable clip with your friends on Facebook, Twitter, and Pinterest.